Eltabina Express was established in 1992 and specializes in the service for bus from Kuala Lumpur to Singapore, from Singapore to Kuala Lumpur, as well as return services of Singapore to Seremban and Singapore to Ipoh. Mainly two types of coaches are adopted to serve the routes, namely 27 Seater Super VIP coach and 37 seater Double Deck coach. Eltabina Express coaches have a reputation of providing comfortable, efficient, convenient and safe journey to destination for their passengers. Eltabina Express counter in Singapore is located at Textile Centre, Jalan Sultan, which is conveniently located nearby the Nichol Highway MRT station (The counter is within 5 minutes walking distance from Nichol Highland MRT station). 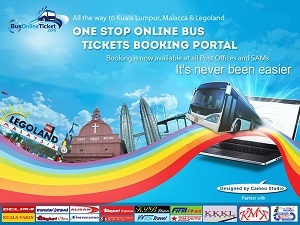 For the alighting point in Kuala Lumpur, passengers have the choice to choose either Terminal Bersepadu Selatan(TBS) or Berjaya Times Square because the coach goes to both destination points. As for Eltabina Express Kuala Lumpur counter, passengers have to check in at Terminal Bersepadu Selatan(TBS). Please take note that Eltabina counter is not at the main counter facing the main entrance. Instead, its counter is at counter 61 in TBS, which is at the left hand side of the main counter (if you are facing the main counter).